asteroids until a weapon is provided. In the Prefs, you can choose between "Practise" and "Mission" game modes. 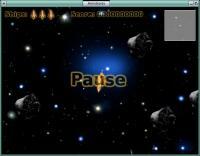 *Practise Mode is like the traditional Asteroids games and clones. level---using the display in the upper right-hand corner to help find them. *Fixed a graphical defect in the asteroid explosions (reported by Lazar Z.). *Fixed a random ship explosion bug (reported by Lazar Z.). *Fixed a few more bugs (thanks to shadowsun for the bug reports). *Adjusted the scoring (bonus points are now given when orbs are collected). *Fixed a bug reported by kas1e. *Fixed another bug reported by TSK. *Fixed a number of bugs (thanks to TSK&Acirc;&nbsp;for the bug reports).